LA JOLLA, CA – Aug. 16, 2018 – Scientists at Scripps Research have solved the structure of a key protein that senses when our cells swell. This protein, called SWELL1 (or LRRC8A), works as an "ion channel" on the cell membrane to relieve pressure inside cells. "This structure provides a first glimpse into how this ion channel senses changes in volume in a cell," says Jennifer Kefauver, graduate student at Scripps Research, the Howard Hughes Medical Institute, and first author of the new study. The next important step was to shed light on SWELL1's molecular structure. The scientists aimed to understand the basics of how this ion channel senses changes in volume. To do this, they needed to take a look at the channel's molecular machinery. Kefauver spearheaded studies as a joint student between the labs of Patapoutian and Andrew Ward, PhD, professor at Scripps Research and leader in a high-resolution imaging technique called cryo-electron microscopy (cryo-EM). 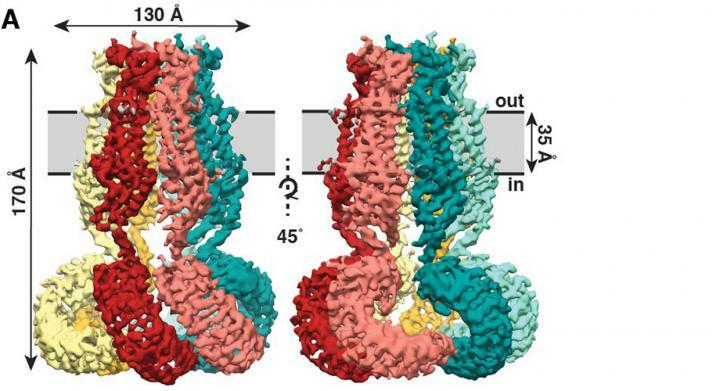 Kefauver used cryo-EM techniques to solve SWELL1's jellyfish-like structure and get a first look at how ions can travel through the channel's central pore. "Jennifer pursued the structure of SWELL1 with great tenacity, leaving no stone unturned and overcoming enumerable hurdles. It was wonderful to see the fruits of her labor result in such a beautiful structure," said Ward. This new look at the ion channel suggests that interacting parts of the tendrils-sites that have a positive or a negative charge-sense a change in ionic strength in the cell (a dilution of the cell's salt contents as it absorbs water). The charged residues could send a signal up to the pore of the channel, telling the channel to release chloride ions from the cell and relieve the pressure. Kefauver is hoping this new view of the structure can fuel medical research. SWELL1 has a role in at least one disease-an immune deficiency called agammaglobulinemia. "Having the structure is really important for scientists trying to understand how this channel works and what disease-causing mutations might do." Additional authors of the study, "Structure of the human volume regulated anion channel," include Kei Saotome, Adrienne E. Dubin, Stuart M. Cahalan, Gunhee Hong, and Tess Whitman of the Howard Hughes Medical Institute and Scripps Research; Jesper Pallesen, Christopher Cottrell and Wen-Hsin Lee of Scripps Research; Christopher Crowley of the Department of Dermatology, UC San Diego and Scripps Research; and Zhaozhu Qiu of the Genomics Institute of the Novartis Research Foundation. The study was supported by the National Institutes of Health's National Research Service Award (grant F31 NS093778-3), the National Institutes of Health (grant NS083174) and a Ray Thomas Edwards Foundation grant.